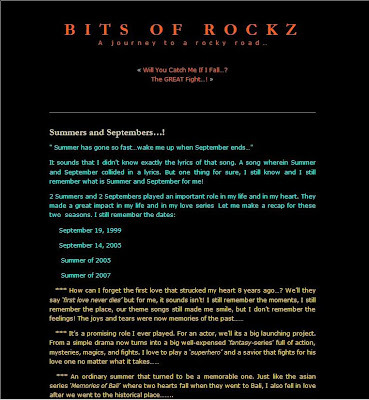 Home Bits of Rocks blogger blogging blogging hobby blogging tips Friendster History of the Blogs Rhythm of the rock rocky's blogs social networking site The Rock Land weblog websites History of the Blogs Chapter 2: "The 'Bits' Where All Started"
History of the Blogs Chapter 2: "The 'Bits' Where All Started"
Let us now go back to the history of the Rocky's Blogs! On the first chapter, I told you a brief summary on how my blogs started. 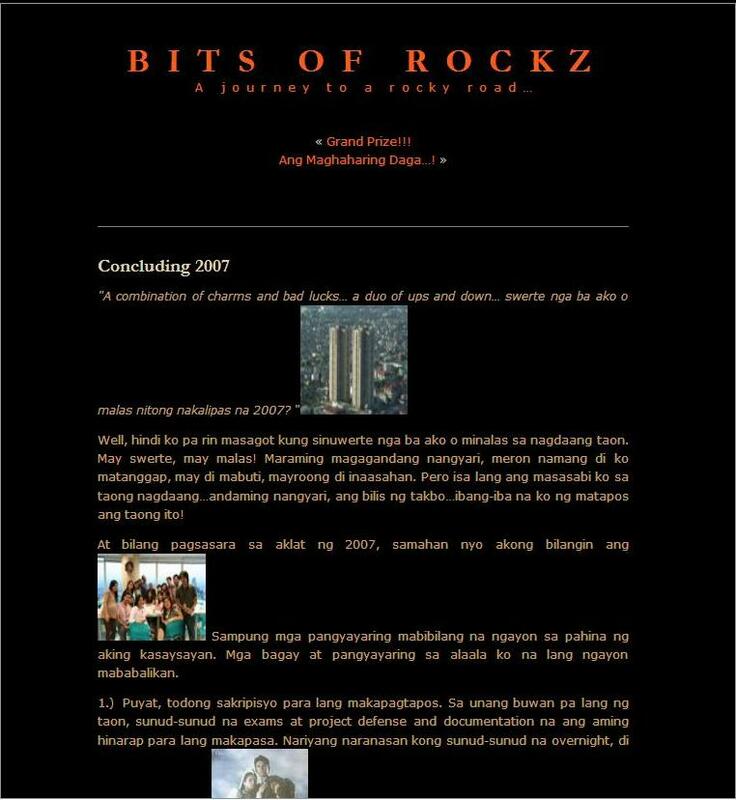 For this chapter, let us go back to the very first blog site where all started! This is the "Bits of Rockz"! Like I told you, this is my very first blog site! It is a Friendster blog which I developed way back in 2007 in my second job. This started my blogging hobby! During break time or during times that no work to do, I write post or articles for this blog. It was called as "Bits of Rockz" since its main purpose is for my personal usage! The rockz in the title is my nickname. Yeah, you can call me 'rockz' for short! And why 'bits'?! It simply stands for every bits of me! Every bits or personality of Rocky! Bits of my moments, bits of memories, bits of my activities, or every little things I did! It's the 'bits' of the whole totality! The Third Part of my "LRT to Bus Story"
The First and Second Part of My "LRT to Bus Story"
The Segment Called "Rhythm of My Heart"
My Summers and Septembers Love Stories! I Remember the Days - posts about my special moments and memories. Journals - contains my daily or recent activities. 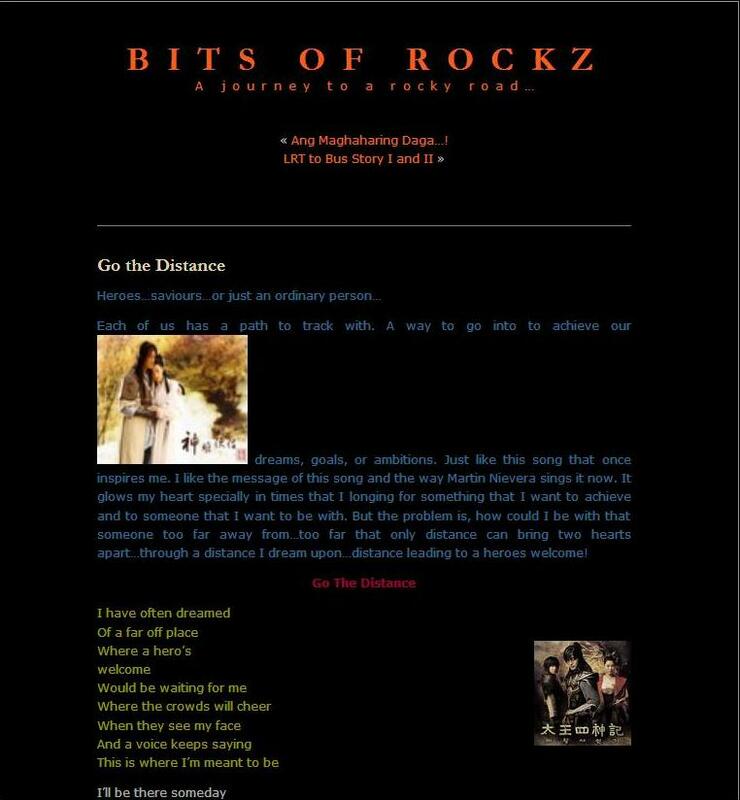 The segment 'Rhythm of my Heart' was where the current hit music blog site "Rhythm of the Rock" derived! Yup, that blog site evolved from this segment! My 'Blogserye' was really a huge hit. 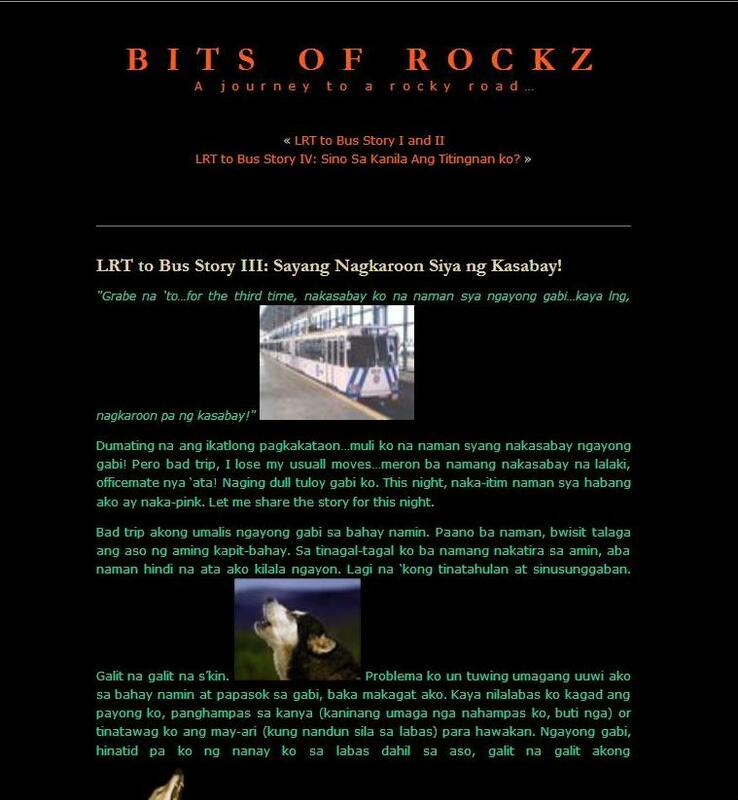 The most famous blogserye article was the "LRT to Bus Story" about the girl I always see in the LRT and in the bus. Yup, we ride together in the LRT and in the bus! It was a four-part special! 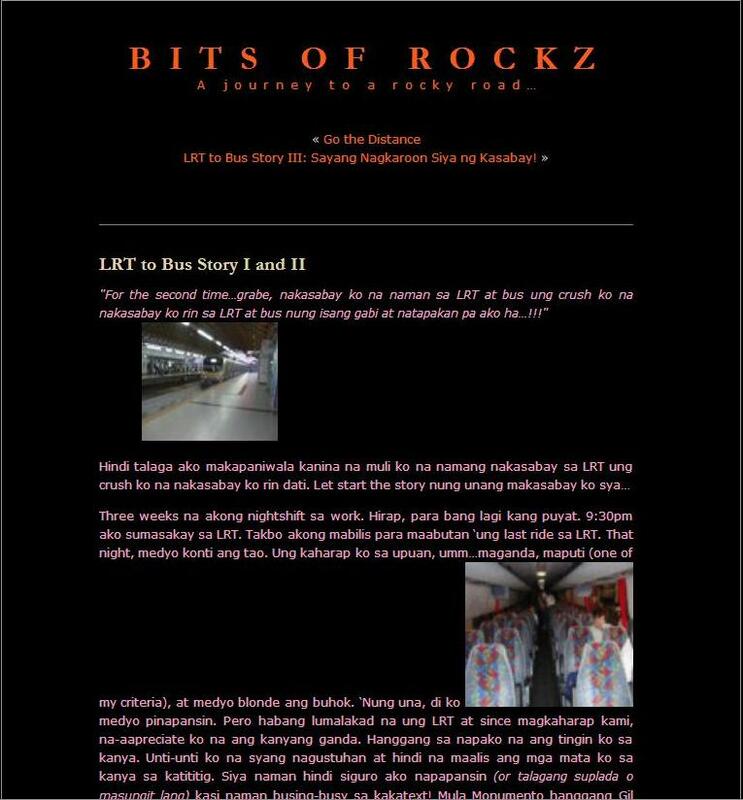 The "LRT to Bus Story IV: Sino Sa Kanila Ang Titingnan Ko" was the last post in this blog. It was published on May 2008. I can no more update that blog from that time since Friendster was blocked here in my third company! But the blocking of different social networking sites didn't prevail my blogging hobby! I explore other things! Until I found Blogger! And this started your favorite blog site now which is The Rock Land together with the others! 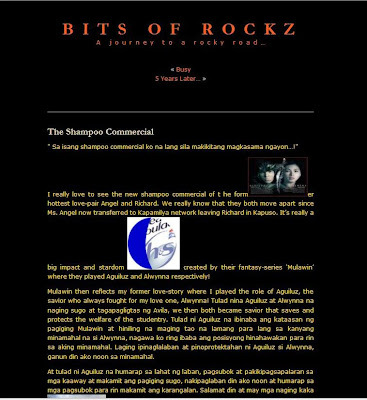 Bits of Rockz was really a remarkable blog site to note! This where all started! Because of it, you now enjoy all the Rocky's blogs! But some of the remarkable posts from this site where already transferred or duplicated in The Rock Land. All my three literary articles from Bits of Rockz which were "Rocky", "The Lord is My Rock", and "Pangitain" were also published here in the Rock Land. Of course my other hit blog post from that site were already here. Yup, the very first posts here in the Rock Land all came from Bits of Rockz! Well if you want to visit that site and read those exciting posts, you may check it in my Friendster account or click here! Yup, it still exist! 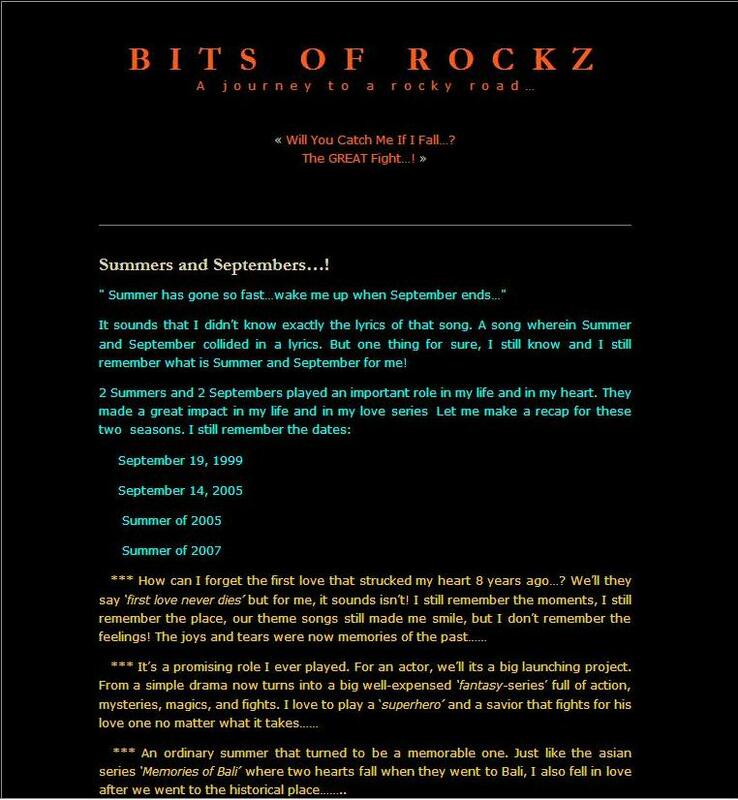 Revisit the start of the Rock's Blogs by visiting Bits of Rockz! History of the Blogs Chapter 9: "The 7th Blog"
Baby James Campaign for Villar! The Latest Soap Dispenser Design! Rhythm of the Rock Now Offers Music Videos! The Rise of the Blogs!